These responses prove the point that Feb. 2nd is deeply rooted in Canadian and American folklore. In the folklore of these countries, the groundhog’s activities are weather related. Simply put, when this animal comes out of his burrow on Feb. 2nd, if the sun is shining and he sees his shadow, he returns underground for six more weeks of winter. If, however, the day is overcast and he cannot see his shadow, an early spring is just around the corner. It will not be a surprise to learn that this folkloric tale has its roots in mediaeval Europe. In the Christian calendar, Feb. 2nd marks the celebration of the Purification of the Virgin Mary and the presentation of Jesus in the Temple. 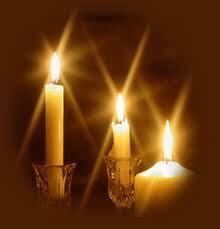 Candles are blessed on this day, giving rise to the name “Candlemas Day.” Since this date also marked the midpoint of winter, halfway between the winter soltice, and the spring equinox, the notion arose that the weather on Candlemas Day might foretell what would take place during the rest of the winter. Thus a bright and sunny Candlemas Day suggested that there was more winter to come; while a cloudy overcast day meant that winter would soon be over. The legend of Groundhog Day is based on the old Scottish couplet: "If Candlemas Day is bright and clear, there'll be two winters in the year." The ceremony in Punxsutawney was held in secret until 1966, and only Phil's prediction was revealed to the public. Since then, Phil's fearless forecast has been a national media event. The groundhog comes out of his electrically heated burrow, looks for his shadow and utters his prediction to a Groundhog Club representative in "groundhogese." The representative then translates the prediction for the general public. If Punxsutawney Phil sees his shadow, it means six more weeks of winter. If he does not see his shadow, it means spring is just around the corner. 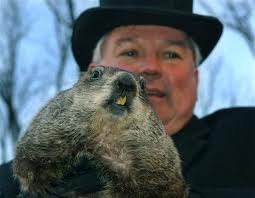 Approximately 90% of the time, Phil sees his shadow and residents contend that the groundhog has never been wrong. Phil started making predictions in 1887 and has become an American institution. Now only one question remains. Why has a folkloric tradition of this type survived so many centuries? There is no easy answer, for such traditions not only have deep roots; they have a habit of “adjusting” to fit changing circumstances. While it can never be proven, one possibility for the recent surge of interest i n Feb. 2nd might be the popularity of the American movie “Groundhog Day” released in 1993. The actor Bill Murray, plays a weatherman for a television station. The story begins with his trek to Puxatawney, Pennsylvania for the appearance of the groundhog. He is reluctantly sent to cover a story about a weather forecasting "rat" (as he calls it). This is his fourth year on the story, and he makes no effort to hide his frustration. On this occasion, due to a sudden storm, cast and crew must stay on location until the weather improves. But something strange happens when the weatherman awakens in the morning . . . it is Groundhog Day all over again! 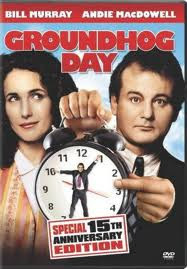 He makes several drastic attempts to leave town, but on every occasion, the next day is always Groundhog Day. . First he uses this to his advantage, then comes the realisation that he is doomed to spend the rest of eternity in the same place, seeing the same people do the same thing EVERY day. Phil did not see his shadow and thus spring is just around the corner! Connected with Grounhog Day is the celebration of “La Chandeleur” in France. La Chandeleur, celebrated on February 2, is originally a religious holiday, yet today it is known as the day of crêpes (“Fête de la Lumière, or jour des crêpes”). La Chandeleur is the Catholic holiday of Candlemas, a feast to commemorate the purification of the Virgin Mary and the presentation of the baby Jesus forty days after his birth. 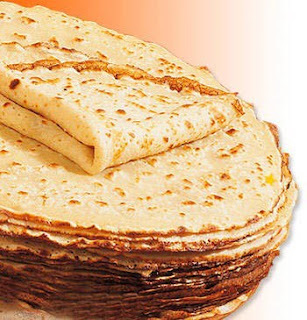 The story is that Pope Gélase gave crêpes to the pilgrims who arrived in Rome. The crêpes with their rond shape and golden color, signified the sun and helped Spring to arrive. Even though most people don't know the history on why they celebrate La Chandeleur with crêpes, any reason is a good reason to eat crêpes in France! For many French people La Chandeleur is a chance to enjoy a lot of crêpes, as well as do some fortune telling while making them. The tradition is to hold a coin in your writing hand and a crêpe pan in the other; then toss the crêpe in the air. If you manage to catch the crêpe in the pan, your family will enjoy prosperity for the rest of the year. You can try making your own crêpe. · I knew about this event. It's very curious. I like our says... "por San Blas, un tonto lo dirá" Sann Blas is the next day to Candelarias Day. "Por santa Lucia mengua la noche y crece el día... por san Blas..."
Ah, I prefer filloas than crepes.